This board book from Thomas Nelson is written by one of my favorite contemporary Christian authors, Colleen Coble! 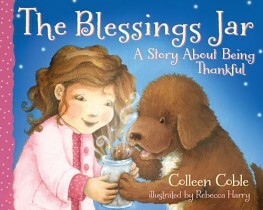 It was wonderful to read a picture book aimed at 2-7 year olds on the blessings that are all around from God. This is a darling book about a Grandma and her granddaughter Punky. Over the past years I have read about the real life Punky and her adventures with Grammy. In this book, Punky has the grumpies because her friend Kiyana can't come and play. Punky thinks that nothing fun is going to happen that day now. Grammy gets Punky to think about God's blessings and how to look for them all around. They put the reminders in the Blessings Jar as they go through their day. Print out the Coloring Sheets HERE to go along with the story. There are 3 sheets total. How do you encourage your kids/grandkids to be generous? We talk about sharing. Don't you sometimes want to play with their toys? At Christmas we donate to families/kids in need. Buying toys and household items. We encourage the use of polite manners and model generous behavior. We also try to set an example about giving not only our money but also being generous with our time. I help them to be generous by giving one child enough for everyone then letting them distribute the goodies. It helps them see how good it feels to give things to others. Works great. I remind my daughter of how lucky we are. My husband and I encourage the grandchildren to be generous and explain to them that others do not always have enough food, clothing, or other things like they do. But I do believe example is the best teacher. We try to take any opportunity to show them how much better it feels to share with others!